(Please note: This post contains affiliate links. This post is long overdue as I am still trying to catch up on all the posts I meant to write about the Montessori-inspired preschool co-op I did last summer. You will see that Hunter looks so much younger in these photos because he was! They were taken eight months ago, and my little man has changed so much since then... Anyway, the ideas I will share with you in this post are based on what we did at the co-op and what we have done at home. For the record, I don't do these activities with Hunter every day or even every week, although that would be awesome for him, I am sure. Food preparation activities, by the way, are part of the Montessori area known as Practical Life (which I explained here), but of course they are not unique to Montessori education. The aspects that align these activities with Montessori principles are the adult's attitude (the goal is not to get the child to do it "correctly" or perfectly, for example) and the manner in which the adult presents them (with slow, deliberate lessons using color-coordinated materials). I think including your young child in food preparation is one of the easiest Montessori principles to apply at home. 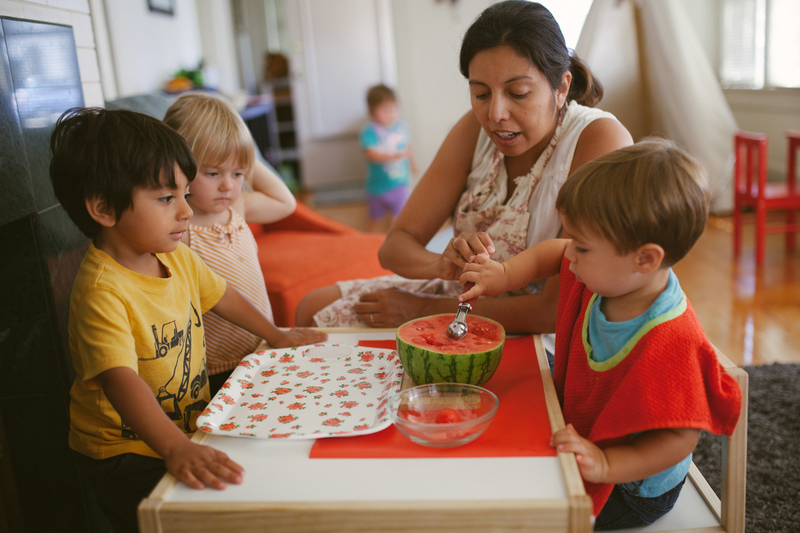 Whether you are running a homeschool co-op or just looking for ways to help your child be more independent at home, there is no better way to boost confidence and teach fine motor skills than involving young children in food preparation. There are two ways to accomplish this: invite your child to prepare his or her own snack and invite your child to help prepare family meals. 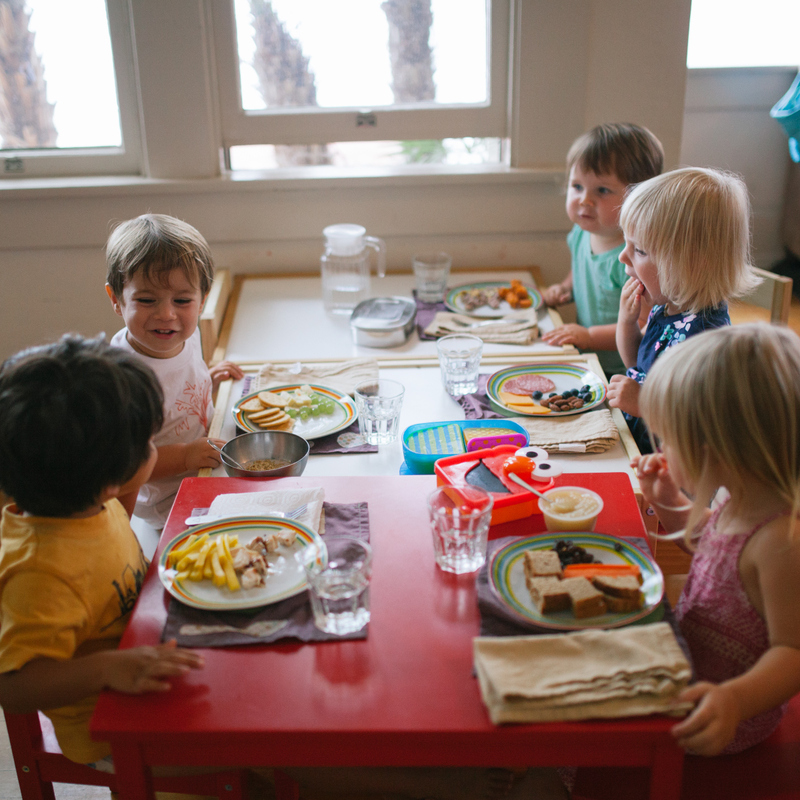 Your child should have access to plates, flatware, and ideally a pitcher and a cup to pour himself his own water. Then, depending on what snack you'd like to have available, you should provide a tray with all the materials your child will need to prepare the snack. The first time you offer the snack, you provide a lesson on how to prepare it. After that lesson, the child is free to prepare it on his or own, with your supervision of course. I am going to be honest -- Hunter does not do much snack preparation these days because it does require some planning and preparation on my part, but he does have access to boxes or containers of raisins that he can serve himself without asking. He can also open the fridge and grab an apple or a hard-boiled egg. I think family meal prep is the easiest way to involve your child in the kitchen because you can adapt almost any part of meal preparation to something manageable for your child. Here are some tasks that Hunter can help with. Just FYI, he is three years old, so some older preschoolers can do much more to help out. 1. Chop zucchini, yellow squash, or cucumbers. I cook zucchini quite a bit, either sauteed or simmered in vegetable soup, so I just hand Hunter his wavy veggie chopper and a cutting board and let him go! I also always provide a large bowl for him to transfer the veggies he has chopped. Likewise, he can chop cucumbers for our salads. 2. Pit the olives. This isn't the easiest task because the tool is better suited for pitting cherries, but Hunter loves this activity. 3. Crack the eggs. This is pretty messy, but I find that Hunter gets a little bit better at it each time, plus he loves it. 4. Wash the root veggies. At the table, I set up carrots or potatoes in a pile on the left, a large bowl of water in the middle, and a kitchen towel on the right. Working left to right, I invite him to take one vegetable, put it in the bath, and scrub it with this brush. Then he sets it on the right to dry. I don't ever force any of these activities on Hunter. Instead, I invite him to help me. Some days he is interested, but most days he is not, so I just let him continue whatever he is doing. I want him to want to help in the kitchen not see it as a chore. If you have any other food prep ideas for young children, please share them in the comments! Living Montessori Now has a great resource here if you like this topic and would like more ideas. You can purchase many of these items through Montessori Services (M.S.) or Amazon. *These are products I own and recommend. These are some really wonderful ideas! I love including Stella in my food prep when I can, especially when I bake. Also, the blog is looking really great!! Love the new look.